Boutique Runway Items - Get great deals on high quality designer shoes, handbags and clothing for men and women. Now you can look like a runway model for a fraction of the price. 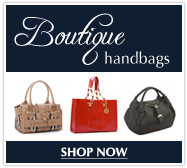 RentMeAHandbag.com's Outlet Store offers great deals on Boutique shoes, clothing and handbags for men and women. Copyright © 2008 RentMeAHandbag.com. All rights reserved.